Q: Is it possible that Nicolas Cage is the next step in human evolution? If so, how does that inform the belief in an afterlife? J&D: No, it’s not possible that he’s the next step in evolution. Why do I say this so confidently? 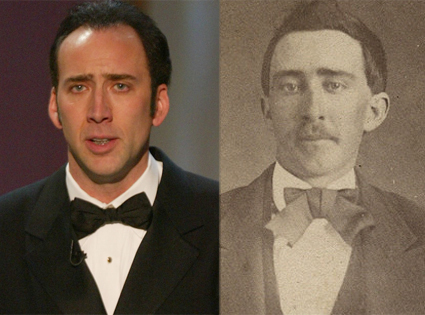 Well, I’m sure many of you have seen proof that Cage is older than anyone thought. The photo on the right was taken in 1870. Is he immortal, though? I can’t say for certain, but he’s definitely the next step in evolution. Nic isn’t the only person, however, who has evolved to this level. Cage’s Face/Off co-star, John Travolta, has also joined the club. The photo on the right is from 1860. Maybe Michael was a documentary of Travolta’s life. Maybe Travolta IS an angel. But these two aren’t alone. I’m sure this will surprise few of you, but another eccentric actor has joined Nic and John atop Mt. Olympus: Keanu Reeves. I’m not sure how much this tells us about the afterlife. Are these actors vampires? Angels? Or maybe even Gods? Q: What would be the most accessible intro to everything wrong with the eschatology of Left Behind from an historical Christian perspective? Mark, I’d start with Seth Rogen’s This Is The End. But seriously, what’s with all of the shows and movies about the rapture these days? In addition to This Is The End, there’s The Leftovers and Nic Cage’s version of Left Behind. Anyway, the most accessible intro to what’s wrong with the rapture is a very brief interview with Dr. Barbara Rossing. She’s the author of The Rapture Exposed: The Message of Hope in the Book of Revelation. In a little over three minutes, Dr. Rossing explains the recent and unbiblical origins of rapture theology. Q: If you were Richard Dawkins’s editor, how would you have made The God Delusion better? J&D: Hmm. I really like this question. I’d tell him to ditch the book and sell his bizarre meme video on DVD. Seriously. Dawkins gave a presentation about memes and then played the oddest video you will EVER see. You will never forget it. I dare you to watch for a minute or so, at least until the owl’s laser beam eyes take off Dawkins’s head. I’m not kidding. This scene actually happens. Is it weird I have that song stuck in my head now? P.S. That whole video reminds me of the scene in Darkman when Liam Neeson wakes up after surviving an explosion. Why do I think that Russell Johnson is the only other person who has seen this movie, and will get the joke before clicking the link? These references are the fruit of a misspent youth, my friend. Delete any part that says God is a scientific theory. 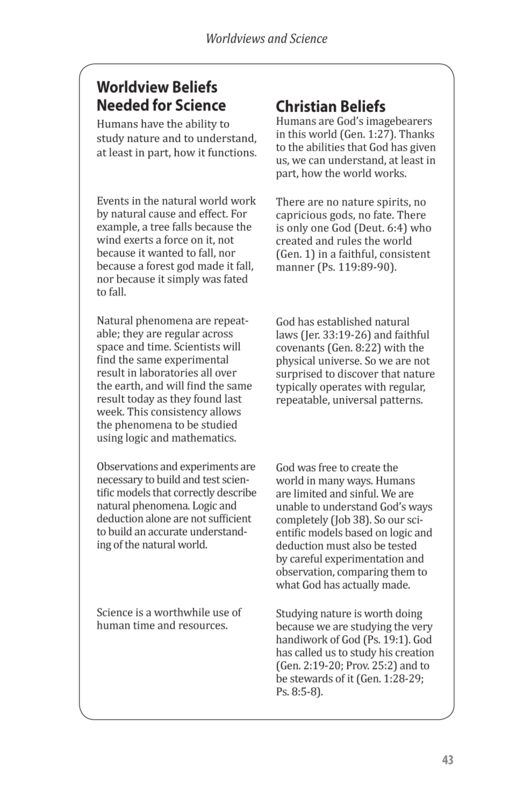 God is NOT a scientific theory. Get rid of his philosophical arguments, which only undercut his case and reveal he isn’t a philosopher. Strengthen two lines of his attack: the God of the Bible isn’t good and evolution causes problems for some versions of Christianity. Cut at least 50-100 pages. I think the book drags on a bit toward the end. I’m kidding about the plagiarizing bit. Half-kidding. I think it’s very important to read The God Delusion. Dawkins’s book doesn’t have great arguments, but it’s worth reading because it illuminates contemporary atheism’s genesis: bad Christian theology. If only such subtle, nuanced religion predominated, the world would surely be a better place, and I would have written a different book. Dawkins’s answer to this question is insightful. I wonder what kind of book he’d have written if the majority of believers were closer to Bonhoeffer than to Robertson. Kevin Love might be on the way too. Johnny Manziel is in town, which means everyone is going to do that money gesture incessantly. A Browns fan invented a time machine. He only uses it to help the team make good draft picks. Q: Defenders of religion often claim that science addresses material realities and religion address spiritual ones. But what are the main insights it actually offers and on what basis did it develop them? The net of science covers the empirical universe: what is it made of (fact) and why does it work this way (theory). The net of religion extends over questions of moral meaning and value. These two magisteria do not overlap . . . we get the age of rocks, and religion retains the rock of ages; we study how the heavens go, and they determine how to go to heaven. A simple picture illustrates Gould’s point. I agree with Gould—and Massimo Pigliucci—that science doesn’t dictate moral values. Sam Harris is simply wrong to say otherwise. For an extended explanation of why he’s wrong, see a great article from Pigliucci. NOMA is also wrong, though. [S]uch harmony can only be maintained within a theological framework, and . . . science ultimately needs theology to secure its own status as science. Science can’t explain its own existence. It depends on a whole host of beliefs—the intelligibility of the universe, its regularity, etc. An incredibly helpful chart, from scientists Deborah and Loren Haarsma, shows how Christian theology supports the worldview beliefs necessary to get science off the ground. Check it out. It’s worth your time. 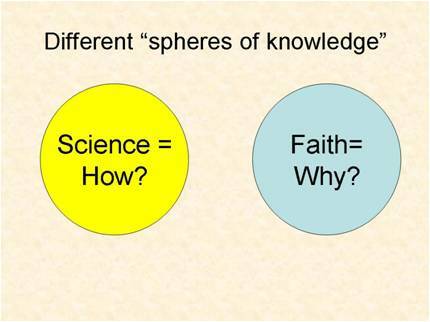 For a more accurate picture of circles that depict the relationship between science and religion, see Figure 1 in an article from Shandelle Henderson. A brand new video from the Faraday Institute also explains the proper relationship between these different epistemologies, or ways of knowing. But the second part of your question remains: what insights does religion offer, and on what basis? The only question that God is a good answer to is “Why anything at all?” Or “Why not nothing?” It’s a response to the contingency not of any particular thing, but of the whole. Christianity says that all of creation is continually contingent upon Jesus: “[Jesus] is before all things, and in him all things hold together” (Col. 1:17). All Christian theology begins with Jesus, a real person who lived 2,000 years ago. As scientist Neil Shenvi says, “spiritual truth is grounded in material fact.” For Christians, Jesus is the basis of religious insights. Rowan Williams, the former Archbishop of Canterbury, explains how finite humanity can say anything true about an infinite God, revealed in Jesus. [W]e’ve seen the face of God, in Jesus Christ. All our Christian language is an attempt to say something quite new, quite unexpected, gratuitous has happened. . . . we’re feeling our way around that great mystery that has been put down in the middle of us. Bodily existence is valuable because of the bodily resurrection of Jesus. Christianity teaches that everyone will be raised into new bodily life, just like Jesus, so bodily existence is important. God doesn’t just take our souls from our bodies. As Jesus says, the purpose of life is to love God and love others as ourselves (Matthew 22:37-39). If we love God, who is love, we can’t help but love everyone: ourselves, others, and especially those with whom we disagree. Q: What is your favorite post, book or article of media on this topic? If you had to pick one to take with you to a desert island. Origins: Christian Perspectives on Creation, Evolution, and Intelligent Design. Scientists Deborah and Loren Haarsma wrote this thorough and gracious book. You should read their book, but if you don’t, check out the book’s super helpful companion website. The website features a great DVD based on the book, which you can watch for free! Did Darwin Kill God? Theologian and philosopher Conor Cunningham made this documentary for the BBC. If you only want to watch one video about science and religion, this is it. In under an hour, Cunningham provides a very helpful and accessible introduction to understanding the relationship between theology and biology. The winner, though, is the book Cunningham’s documentary is based on, Darwin’s Pious Idea: Why the Ultra-Darwinists and Creationists Both Get It Wrong. He argues that creationists practice bad science and theology, while people like Dawkins deify their science and sabotage it. The book has remarkable breadth and depth, along with a devastating wit. Cunningham displays deep knowledge of biology, theology, church history, philosophy, and philosophy of science. If you’re thinking about reading this book, you should watch Cunningham’s great Oxford lecture about it first. At the end of the lecture, he summarized his book’s argument in one sentence: “It’s easier to believe in evolution if you believe in God.” For Cunningham, atheism leads to materialism, which leads to nihilism—which doesn’t allow for the existence of science, evolution, or even evolutionary biologists! I’m not sure I agree with every bit of his philosophy, but Cunningham’s long, funny book would certainly kill time on a desert island. Thanks for submitting these great questions! Have questions for next month’s mailbag? Contact me. Did an owl stare laser beams through Dawkins head just now? Yes. I don’t know how he survived that. Perhaps, like Nic Cage, Dawkins is immortal.